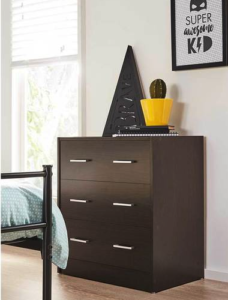 The compact design of this stylish three-drawer unit makes this a great space-saving storage solution. Three deep drawers provide plenty of room for clothing, including bulky items. Sleek, silver coloured handles and a smart brown-black finish give a stylish, contemporary look. The square-edged design of this compact unit enables it to fit easily into small spaces and cosy corners to create a streamlined look. See images for measurements. 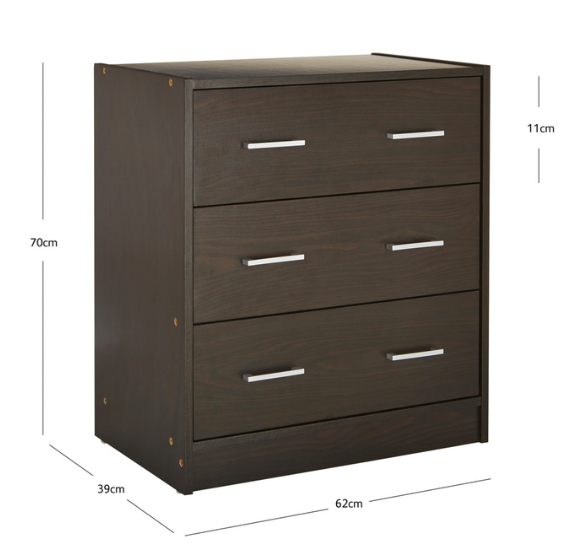 Easy access drawers – open and close in one smooth movement keeping clothes neatly stored inside for a tidy room.